Ambient Music Generator is a tool for generating "Ambient Music" dynamically. To generate a sound, simply shake iPhone, or change the algorithm settings from "None" to "Random". When you shake iPhone again, the sound stop. There are three generators in all. You can switch each generator by flick. Each generator has several parameters. You can generate a sound by adjusting these parameters. You can select the algorithm to be generated. Once selected, the sound starts playing automatically. You can change the root key, the scale and the range of pitch. 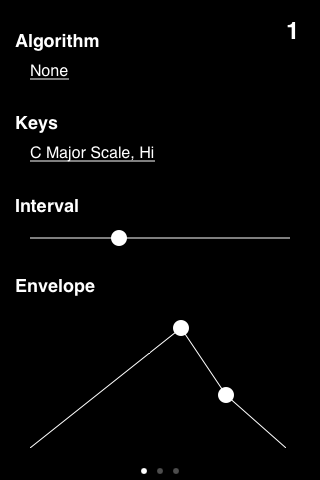 You can change the interval of each tone by dragging the slider. You can change the character of tones by dragging two sliders. Please contact AMG Support if you are experiencing technical difficulties.